After two months touring the country we faced our last couple of days heading back along the north coast to Tunis. We were sad to say goodbye to our wonderful shabby chic hotel room overlooking Tabarka, knowing this leg of our trip is drawing to a close. A day of sunshine and lush green scenery lifted our spirits though. After driving through some busy market towns where we seemed to be a part of the action, we topped a hill and round a bend and saw Jebel Ichkeul and the beautiful lake below it in front of us. 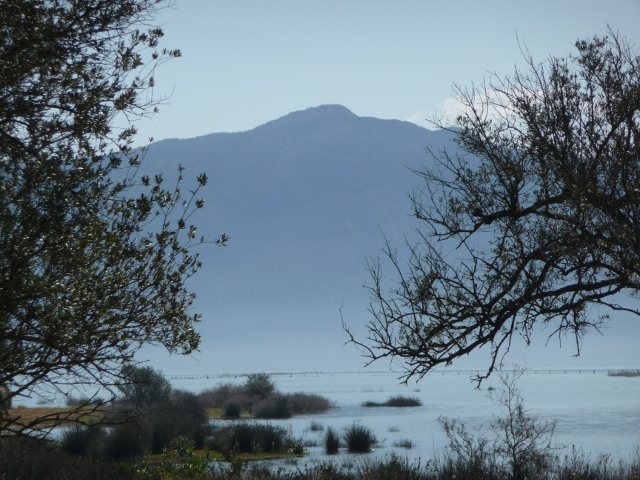 This blue shadowy mountain with sparkling water and verdant meadows beneath is one of the most stunning of views in Tunisia. The road took us close to the western end of the lake and we stayed by its side across the north shore too. 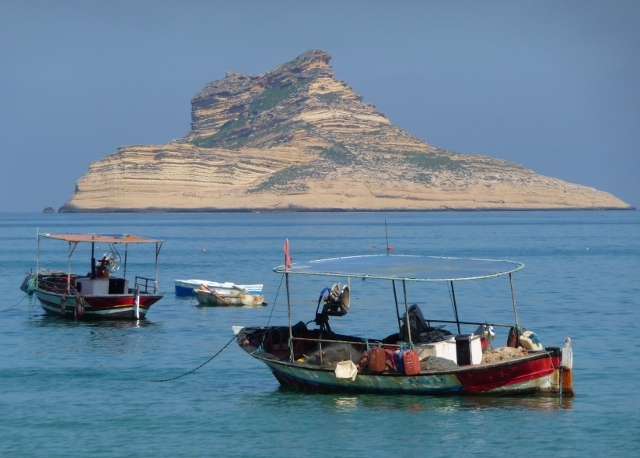 Then we skirted the southern edge of Lake Bizerte, the city of Bizerte visible on the far side, and the coast to its east taking in the small town of Gar el Melh with its three forts and out along the cape as far as the small seaside town of Rafraf with its fishing boats. And so back to Tunis and to the Grand Hotel de France again. We got the same room and parked the van in the same spot at the parking garage round the corner, and were greeted like old friends. 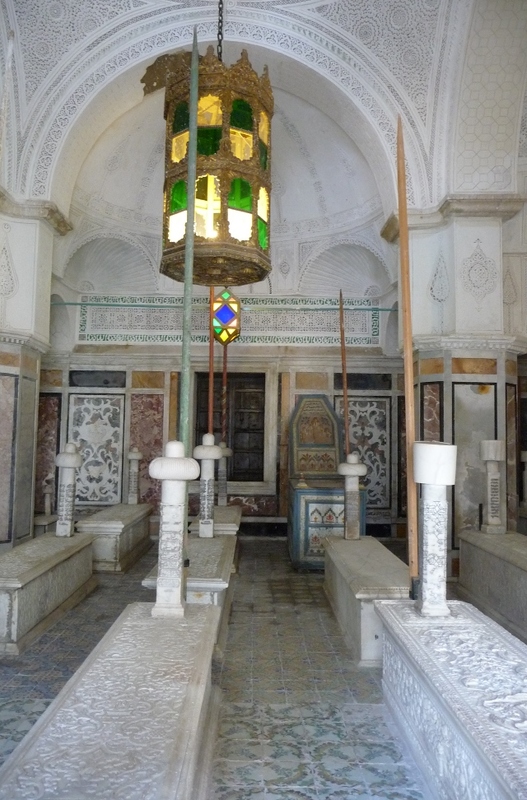 We wondered what we would make of Tunis after seeing the rest of the country. The modern European flavour of the newer part of town struck us very strongly, the older parts of town assaulted our senses as ever though. We explored the crowded alleys and byways through the souks and markets yet again, still finding new ones. Familiar, yet always captivating, we could never tire of this lively winding tangle, although our feet might. The life and activity here encapsulates the country and its wonderful people. There is a view every few steps and it’s easy to take nearly 200 photos before lunch. A day or so was spent wandering punctuated by tea stops and delicious snacks and meals – our last opportunities to sample our favourite Tunisian dishes – and seeing a couple of minor but special sights such as the Tourbet el Bey housing the Husaynid dynasty’s tombs from the 18th century to the death of the last prince, assassinated in 1953. Walking down the busy shopping street by the market hall, crammed with street sellers with makeshift stalls offering anything from pegs and loo rolls, to chicha pipe tobacco, china plates and designer knock-offs, there was a sudden change in the bustle of the scene, and with a flurry of plastic sacks and cardboard, they all disappeared within seconds. We saw them lurking around corners. Then a bunch of uniformed police marched down the street … once they were out of sight stalls were out again and business continued as before. On our last afternoon in Tunisia we collected the van and drove out to scope out La Goulette, the small town where the ferry port is. From there we followed the route we took two months’ ago in the train along the coast, past the ruins of Carthage out as far as La Marsa, a rather well-to-do seaside suburb. It was Saturday afternoon and the beach and streets were heaving with visitors enjoying the warm spring weather and ice creams. 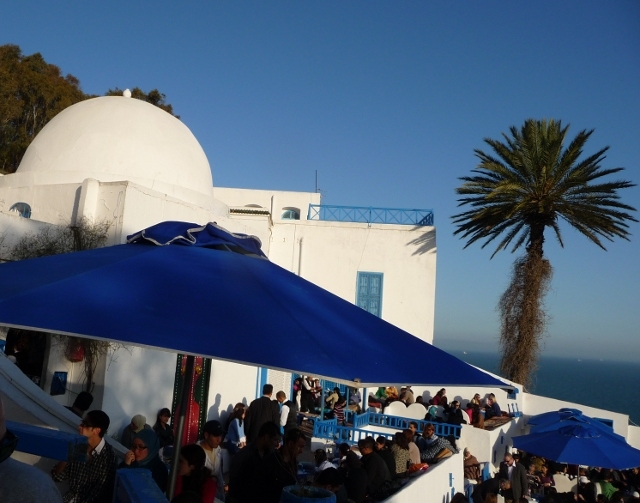 One stop back towards La Goulette was Sidi Bou Said, the blue and white town on a hill overlooking the Gulf of Tunis. It was quiet when we visited in January. Now it was in full swing and thronging with people and traffic. It was lovely to go back there though and enjoy the views from the expensive café, but we were glad to have seen it at a more tranquil time too. By the time we got on board and found our reclining seats for the night crossing, a family of four was fast asleep in them and we didn’t have the heart to wake them. All the other seats were either full or people had removed the cushions for sleeping on the floor. We thought about a cabin, but the cost would be around the same as three nights in a Tunisian hotel, so we gave up and found some floor space in the bar to stretch out on, relieved when the boat started moving and we finally left Tunis at close to 3am. Only four hours late and nine hours to go. Bislemma Tunisia – goodbye Tunisia. Some sleep was achieved though and once we started spotting the islands close to Sicily, and found out that the boat would dock only two hours behind schedule, we started looking forward to arriving. On the way out to Tunisia, we’d enjoyed the cruise past the coast near Zingaro and San Vito Lo Capo and it was great to see it once again – the familiar shapes of the mountains and bays – rounding the final bend from Mondello into Palermo harbour with its dramatic setting. The mountains in the distance were snowy, the sunshine warm, but the sky was hazy and streaked hinting at Etna’s active presence many miles beyond. Palermo port is really just off the main drag, so it turns out it doesn’t have a passport control section – there simply isn’t room. So immigration formalities take place on board the ship. Everyone with a red EU passport to gather in one place, all those with a green Tunisian passport (or other non EU), in another at the other end of the boat. There we waited crammed in for quite some time. Luckily Adrian had judged the likely position the morasse of people would move in towards the control on the deck below, so we were fairly far forward. The three officers sat at a white plastic table with their laptops and checked everyone slowly through. Finally we had arrived. So to the car deck and there was our van in the middle of the lines of cars still waiting for their owners. It could be another hour or more to wait for them so we could get off. Thankfully it wasn’t as bad as it first looked. There was a little bit of space here and there and with a bit of clever manoevering, following three different sets of directions, we were able to escape and drive joyfully out into the busy Palermo traffic. We took a slow coastal road east out of town towards a campsite near Cefalu we’d stayed at briefly back in late November, stopping to buy supplies on the way. We had of course especially been missing pork-related delicacies and hit a delicatessen to buy hams and sausages. That first mouthful of prosciutto crudo the owner gave me to taste – the first ham in more than two months, was heavenly. Suddenly we were in love with Italy all over again. With our ferry docking so late we had only just made the shops which close by 1.30pm on a Sunday, but hadn’t bought any wine … disaster! But our lovely German neighbours at the campsite were touched by our plight and came to the rescue with a rather nice Nero d’Avola. This entry was posted in Art & Culture stuff, By Country - Italy, By Country - Tunisia, Food stuff, Travel stuff. Bookmark the permalink.